John Douglas has had a lifetime of experience in music. He has taught privately for over 15 years, and has performed professionally on saxophone, clarinet, and flute for over 30 years. John’s education includes early studies with revered Bay Area saxophonist Ben Meltzer, performances with the Monterey Jazz Festival High School All-Star Band, and as the lead saxophonist in the California All-State Jazz Ensemble. A graduate of the highly regarded Music program at Los Medanos College in Pittsburg, CA, where he studied privately with Diane Maltester and Mary Fettig, John went on to pursue studies at Cal State University at Northridge in their BM program for music performance, where he played the solo E flat clarinet chair in the University Wind Ensemble and Lead Alto Saxophone in CSUN’s prestigious “A" Jazz Ensemble. John currently performs in numerous ensembles, including the Kelly Park Big Band, René Escovedo and The FUSE, The James Moseley Band, Afrolicious, and several others. Recent performances have included engagements with the Marcie Brown/Terrence Brewer trio (on KPFA radio), Anne Sajdera Ensemble, Jerry Lopez (Santa Fe & FCH), ANCORA! (Italian World Music), and Pulse Brasil (Brazilian Bossa Nova and Popular music). 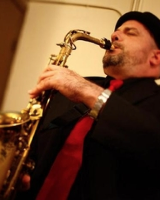 He has performed everything from solo saxophone engagements to orchestras, rock/funk bands to musical theater, Jazz trios to chamber ensembles. John currently directs the Benicia Unified School District Elementary School Band, and is a Band Director for the Children’s Music and Arts Foundation. He has been on the teaching staff of ABC Music for over five years. John has been fortunate to study with many wonderful teachers and has enjoyed playing for many years.